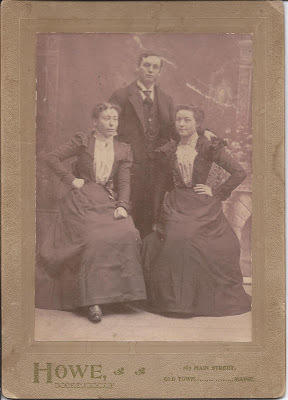 Late 1800s photograph, taken by the Howe studio of 167 Main Street, Old Town, Maine, of three people who appear to be siblings. The reverse has an identification, but it isn't quite what one would expect. Finally, someone has found a use for unidentified photographs! 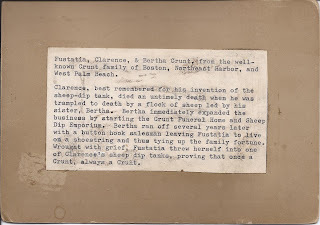 Fustatia Clarence, & Bertha Crunt, from the well-known Crunt family of Boston, Northeast Harbor and West Palm Beach. 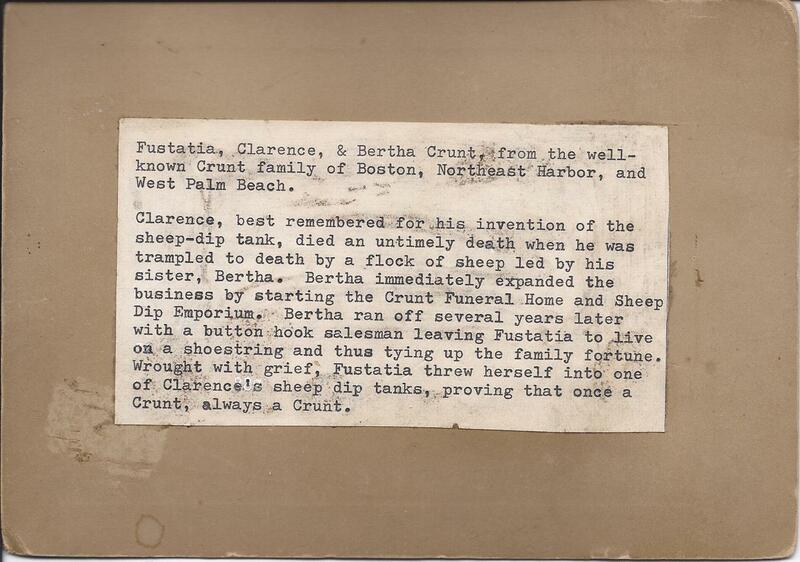 Clarence, best remembered for his invention of the sheep-dip tank, died an untimely death when he was trampled to death by a flock of sheep led by his sister, Bertha. Bertha immediately expanded the business by starting the Crunt Funeral Home and Sheep Dip Emporium. Bertha ran off several years later with a button hook salesman leaving Fustatia to live on a shoestring and thus tying up the family fortune. Wrought with grief, Fustatia threw herself into one of Clarence's sheep dip tanks, proving that once Crunt, always a Crunt. 3) If the photograph is identified, don't name the people or show the ID. 5) Entries, consisting of a link to your blog post, must be posted to the comments section of this blog post, by May 1, 2012 to be eligible for a prize. 7) Prize - I'm thinking - maybe some Maine Maple Syrup mailed to you?? Don't get excited about a certain crustacean, though I would spring for 2 lobster rolls from Quoddy Lobster (sheer heaven) if you foot the bill for yourself and a companion to get there. Fire up those creative juices! !